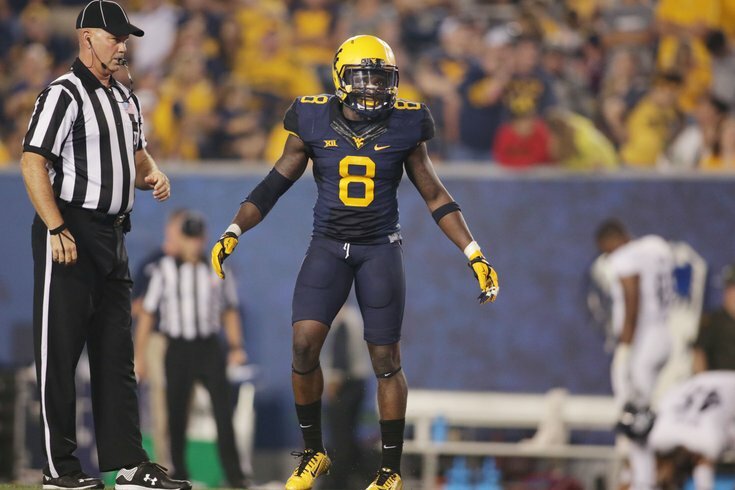 I would not want to be hit by West Virginia safety Karl Joseph. It has been a long time since the Eagles had a safety tandem as good as Malcolm Jenkins and Walter Thurmond were a year ago. Jenkins does everything well. He can play the run, you can leave him on the back end in single-high looks, he can play man-to-man against slot receivers, and he is a respected leader of the defense. As a result, Jenkins was rewarded with a new five-year deal worth $40.5 million. Opposite Jenkins, Thurmond was good in his role as a safety who could cover slot receivers, and he had the speed to play on the back end, but he was not an adequate tackler from his safety spot. Thurmond will be a free agent on March 9th when the new league year begins unless the Eagles lock him up with a new deal, which I don't anticipate. Even if the Eagles like Thurmond and are able to retain him, they were running guys like Ed Reynolds and Chris Maragos onto the field at times last season. That's not ideal. At a minimum, they need more depth at safety, and if Thurmond walks, safety will become an even higher priority. Thompson is a more traditional safety than Jeremy Cash below (although still versatile) and a ball hawk. Throughout his college career, Thompson had 19 interceptions. He also has great size, at 6'1, 215, and can play in the box. This is one of those players who you'd never take anywhere near pick 13, but he likely won't last until the third round, since the Eagles don't have a second-round pick. Thompson showed well at the Senior Bowl. The only way he'll will become an Eagle is in some sort of trade-way-back scenario, or if he unexpected slips to the third round. Cash doesn't play a ton of deep safety, and is almost more like a linebacker. He has good size for a safety and plays with a physical demeanor. 38 tackles for loss and nine forced fumbles in just 39 games from the safety position is absolutely ridiculous. If Jim Schwartz wants to pair a mean run-stopping SOB with Jenkins, Cash could be a great fit. If the Eagles are going to continue to look for safeties more geared toward being able to cover slot receivers man to man, Cash will not be their guy. Joseph is a guy who looks like he was born to play football. If his medical evaluations from an ACL tear pass the doctors' approvals, he could be a second-round pick. If there are some concerns and he slides a bit, he could be a tempting risk with major upside in the third. Bell has served both as a nickel back and safety for the Buckeyes, so he fits the bill in terms of the Eagles' former preference for safeties who can drop down and play man-to-man in the slot. Bell does not have the physical presence that Cash or Joseph do, so a team will really have to fall in love with his coverage abilities to take him high. Dillon was the lesser-known of WVU's safeties, and frankly, he wasn't on my radar at all heading into the week of Senior Bowl practices. However, in Mobile, he showed impressive cover skills and had a few nice pops on running backs. He could be a late-round developmental player.